After leaving her secondary school with a handful of ‘GCSEs’, Rachel has now graduated with a degree from the University of Warwick and is studying her final year of her MA Social Work. Rachel, didn’t meet the qualifications traditionally needed to go to university, and instead opted for a career in administration for more than a decade before hearing about the courses CLL offer. She applied for, and successfully completed, our 2+2 degree pathway and graduated with an upper second class degree in the Summer 2017 Ceremony. After completing her first year of her MA Social Work, she was also offered a job over her summer break by the placement she had been attending as part of training on the course. 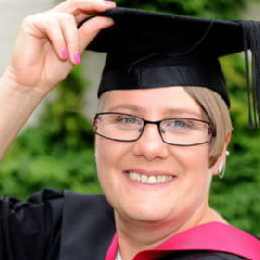 “I still can’t quite believe I’ve completed the degree and I’ve graduated. I’m very proud of myself. I’ve done something I never thought I’d be able to do”, Rachel said. "For years I wanted to do something else but had no idea what. I needed more of a challenge." Rachel chose to study for the first two years of her degree at Coventry College before moving over to Warwick for the final two years of her 2+2 degree and the MA in Social Work. Rachel, who wants to become a Social Worker specialising in cases involving child sexual exploitation and human trafficking, said that she would encourage others to return to education.